~ ~ ~Jayne Stamps ~ ~ ~: Am I coming or going - and how long do I have until Christmas? Am I coming or going - and how long do I have until Christmas? Do you ever have those times where you feel like you're just rushing from one thing to the other? That's been my life lately. It seems like I have a lot to do, but the time just starts flying by and before I know it, another day is gone. And it's not like I haven't accomplished anything, it's just that I haven't been able to do what I WANT to do. I spend most of my day doing medical transcription when I'd rather be stamping! 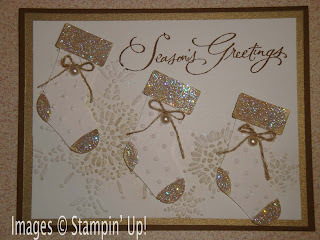 However, even though I haven't had much time to stamp lately, I still have some great cards to share with you. These were from a recent Upscale Swap. I love the bling on this first card from Carol Stelzer-Wheaton. It's even prettier in real life! She used the Stocking Builder Punch and some textured impressions embossing folders to spice up this card. This card also uses the Stocking Builder Punch but is a simpler card. If you have to make a LOT of cards, this might be a good idea for you. 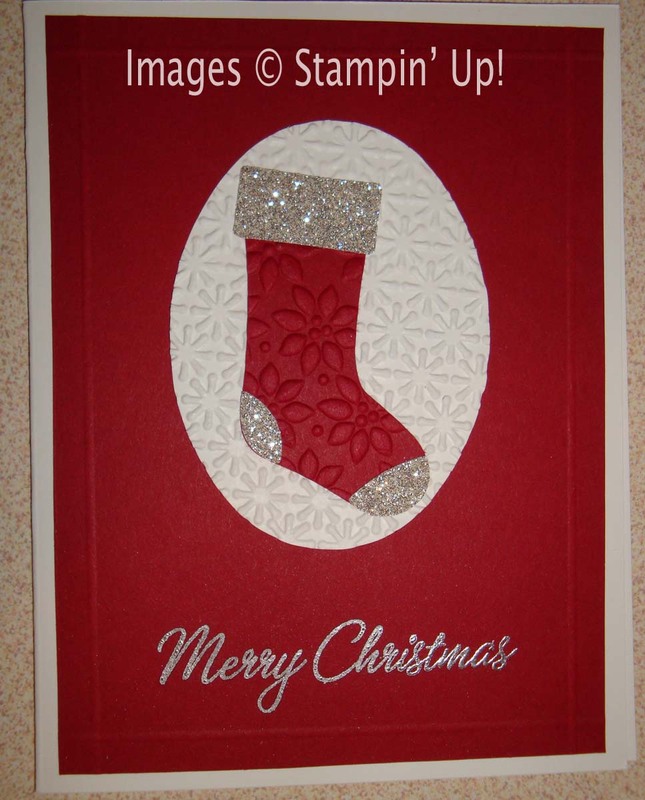 It's still got the bling factor with that Silver Glimmer Paper, and some great texture with two embossing folders. Carla Schultz made this card. And last for today is a card by Anita Ferre. Simple, elegant, beautiful. She colored some of the Basic Rhinestones red (the other ones are clear, but they sort of look blue in the picture). 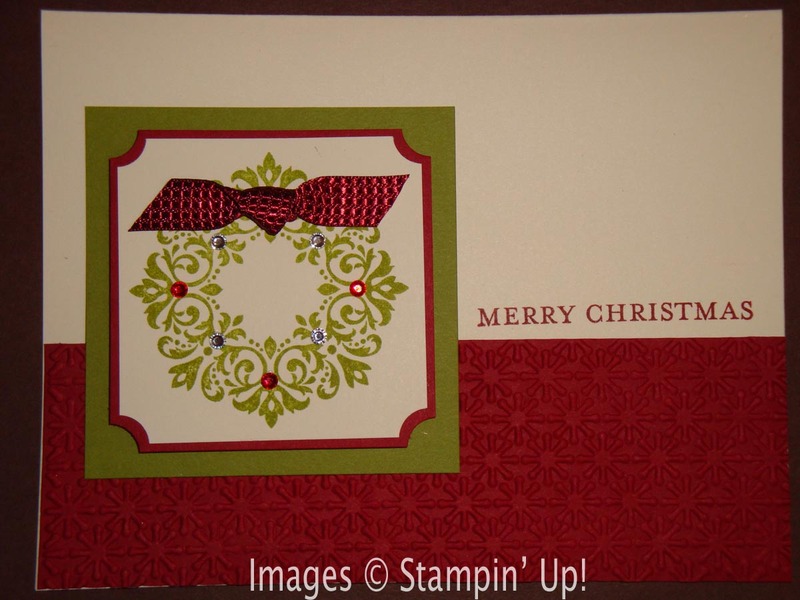 This is another card that wouldn't be too difficult to recreate a lot of, but the extra touches like using the Ticket Corner Punch and the Snow Burst TIEF, plus that little knot of the 3/8" Quilted Satin Cherry Cobbler ribbon make it a stand out card. Oh, and in case you didn't know, this is the Bright Hopes stamp set in the Holiday Mini Catalog. By the way, did you see Shelli Gardner on the Today Show on Tuesday? Stampin' Up! has donated products to Toys for Tots for at least the past three years. 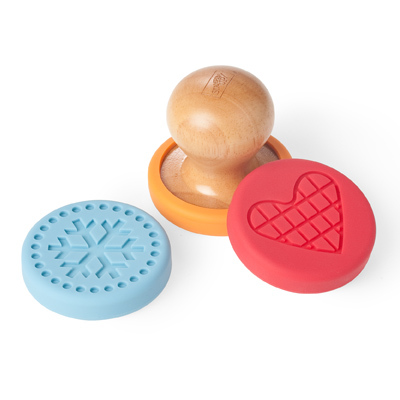 Shelli showcases our new Sweet Pressed cookie press stamps - so cute! (Hopefully I did that correctly, but if you can't see the video, you can go to http://video.today.msnbc.msn.com/today/45568467#null to view it.) I love being a part of this company! Take your love of stamping into the kitchen! Create fun and tasty stamped cookies for any occasion. Fit a silicone stamp over the bottom of wooden handle and press into dough—it’s that easy! Let the kids help! Food-safe, easy-to-clean and dishwasher safe. Each set includes 3 silicone stamps, 1 handle, and 2 great cookie recipes.